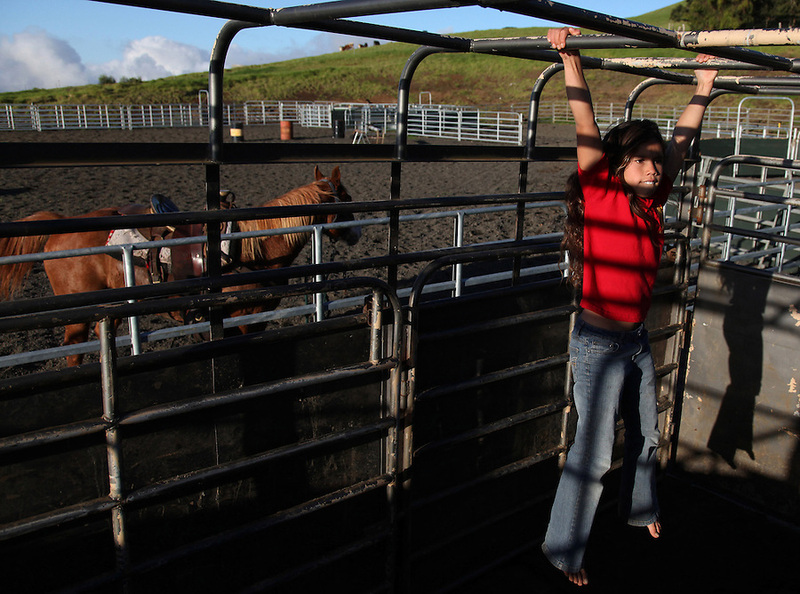 Nahe Tachera, 9, whose great-grandfather, grandfather and father are or were all cowboys, uses the horse trailer as her jungle-gym on Kahua Ranch in North Kohala, Hawaii. Nahe and her sister, Kamehana, 11, live with their father, Wayne Tachera, in "cowboy housing" on the ranch. The girls learned to ride horses as toddlers and have grown up with the ranch as their playground. "My dad's work is great. While he works, we can play around the ranch and he doesn't have to worry about us", says Nahe. "We're definitely cowgirls", adds Kamehana who regularly competes in rodeos and who can often be found cutting photos of cowboys out of magazines and pasting them in her scrapbook.